Today on homify we're heading to the Isla de la Piedra (or Stone Island) in Mazatlán, Sinaloa. Designed by Cervantes Bueno Arquitectos, this timber dwelling boasts enviable outdoor spaces, paired with well-designed interior areas that have been arranged to suit the surrounding landscape. 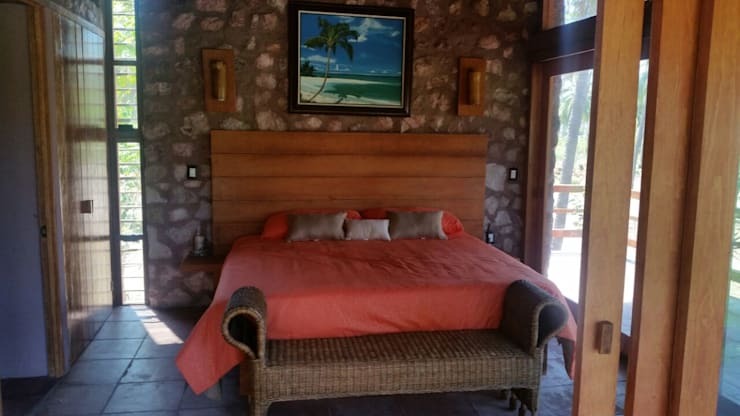 Bordering the Gulf of California, the bungalow is offered a warm climate, with abundant tropical vibes. The two-storey residence offers a good volume of natural light, and has been well-positioned by the architects to enjoy both morning and afternoon light. 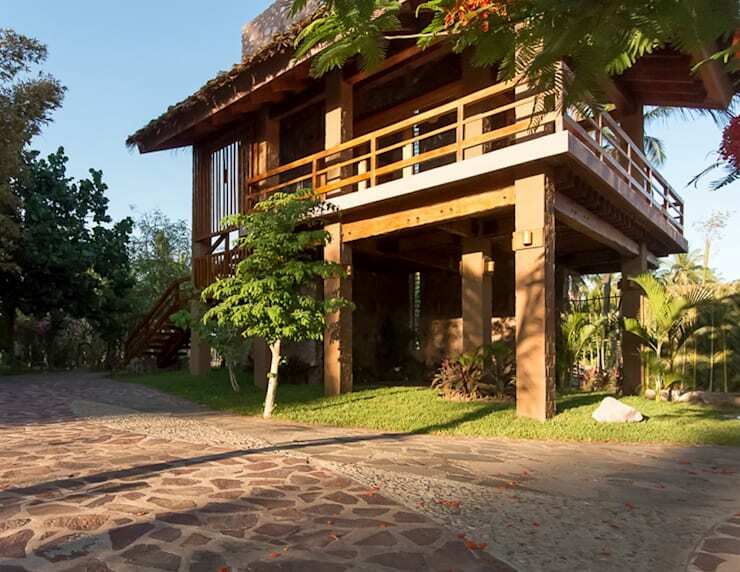 The upper storey boasts a private space for sleeping, along with a terrace and en suite bathroom. Situated on the ground floor we see a living area that expands to the garden, connecting both the indoors and outdoors. Boasting both indoor and outdoor living, this semi-open room offers living quarters, and a striking exterior Jacuzzi. Comfy deck chairs add the perfect space for a nap, in addition to more upright seating that would work perfectly if entertaining guests, family or friends. 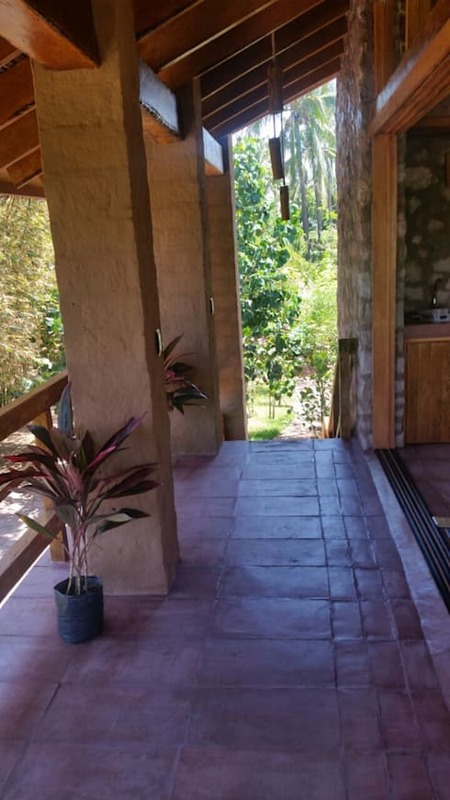 Lush and rustic, the combination of recreational space with relaxation space is well-planned and engaging. Plants have been grown around the structure, enhancing the timber frame, and ensuring it fits in perfectly with the surrounding landscape. Are you ready to head upstairs and take a look inside? 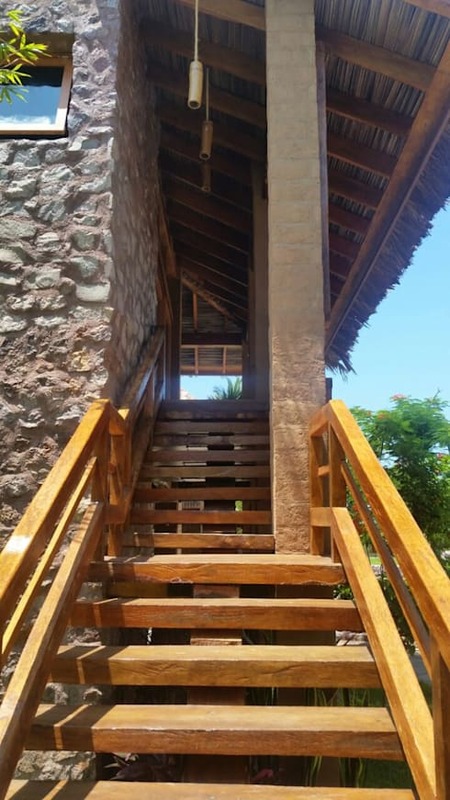 The exterior timber staircase embraces a lighter wood hue, while the thick profile of each step ensures the structural integrity and style of this provincial architectural accessory. 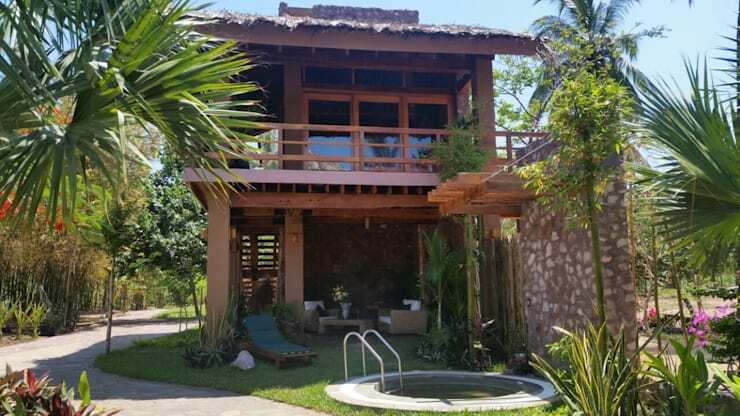 As the bedroom and bathroom are located on the upper storey, a private terrace has also been included to offer a wonderful space for relaxation and more private rest. Large sliding doors are able to be opened, providing the bedroom with a sense of connection with the exterior environment, while the same earthy colour scheme has been employed throughout. Filled with light thanks to the large open windows, this bedroom is perfectly located to take in some glorious afternoon sun. Replete with exposed stone walls, artwork and wall-mounted lighting, this space is sure to get you relaxed and feeling ultra-comfy. Red bed linen pairs well with the earthy tones throughout, while a bench at the end of the bed adds practicality and style. 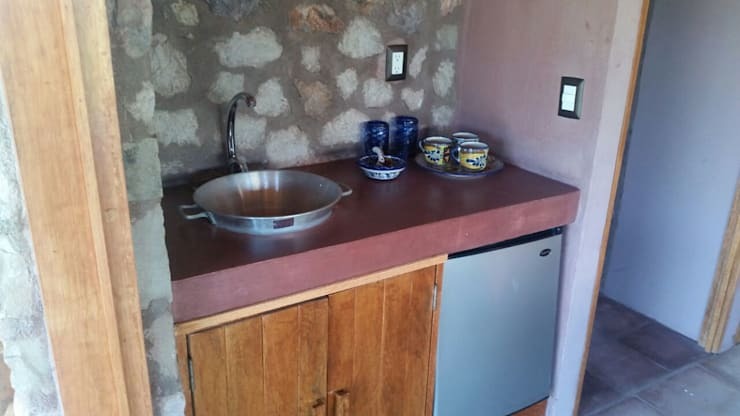 For added practicality, the room and bungalow is provided a small kitchenette. 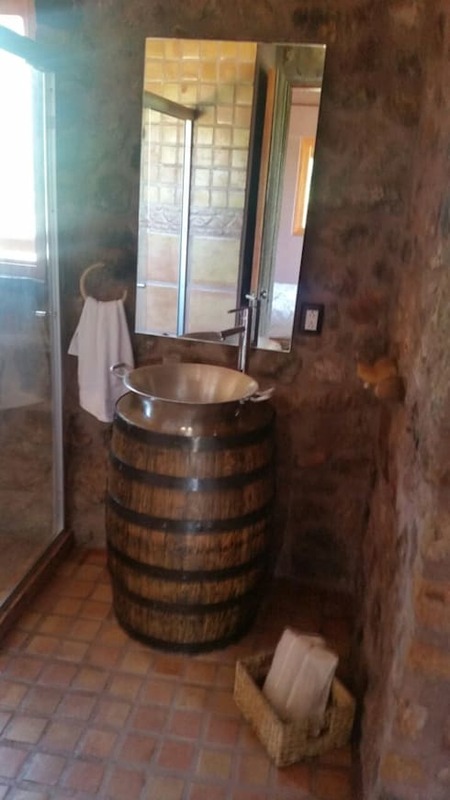 Much like the bathroom (which you will see below) the sink is a metal bowl, which compliments the rustic style of the entire home. Exposed stone walls are employed throughout the dwelling's interior, boosting the sense of connection with natural materials, and improving the romantic, effortless vibes. Last up we enter the bathroom to take a look at the rustic setup and choice of materials. It is here that we notice the room is rather romantic, similar to the bedroom, and utilises items that are eye-catching and striking. The barrel sink is the immediate attention-grabber, while there are more practical items such as the mirror, which assist in providing a useful and beneficial space. Where is your favourite holiday destination? Let us know below!